Sheridan College Animation Industry Day. I'd have to concur that this was a particularly strong year in both the 4th Year personal films and the 3rd Year group films. I may be a bit blunt in my assessment, but I feel that last year's crop of 4th Year films included far too many Flash produced efforts with little more than moving graphics. Many of them were very good in terms of storytelling and filmmaking skills, but were frankly disappointing in terms of character animation. This year was a pleasant surprise for me, as I feel that the majority of 4th Year students really aspired to more personality based, full character animation. Though there were some very impressive CG films, I'll admit I'm still biased in favour of hand drawn animation and I found much to like this year. The highlights for me were Andrew Ferguson's "The Street Magician" and Matt Kalinauskas' "Two by Two", both of which showed great flair for cartoony design; Melissa Maduro's "A Romance in Graphite" and Marion Coffey's "The Little Colour Thief", both showing simple elegance and charm in their appealing, fluid character animation; and of course, Vlad Kooperman's very impressive "C Block", which I know received a very positive reaction from everyone in the theatre. And these are just a few of the better ones, as there were many other notable films I enjoyed very much. All in all, a very impressive and entertaining screening yesterday at Sheridan, and I think the graduating students should be very proud of their achievements. I look forward to seeing great work from them onscreen in the years to come and I'll always have fond memories of working with them in my class back in their 2nd Year. I arrived home this evening to read the very sad news that legendary Disney animator, Ollie Johnston, has passed away at the age of 95. 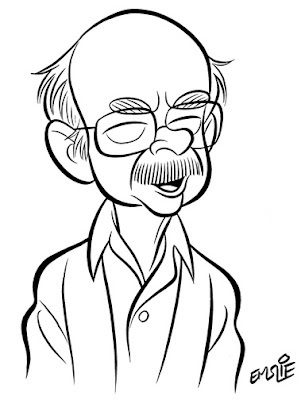 While it is always sad when such major figures from The Golden Age of Animation pass on, Ollie's death is particularly heartbreaking for me, as I had been lucky enough to have known him, as well as his longtime friend and colleague, Frank Thomas. Though both were wonderful fellows, Ollie always will occupy a special place in my heart for several reasons. Back when I was 7 years old, Disney's "The Jungle Book" premiered in theatres. 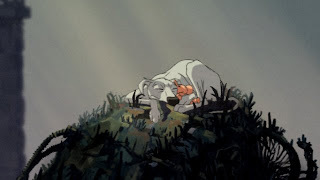 As I have written in a previous blog entry, it was this film that was the catalyst in starting me down the path to wanting to be a cartoonist and, hopefully, working for Disney someday. In particular, it was the character of Baloo the bear that I was so fond of, and the warmth and charm of the animation that so skillfully brought him to life. It wasn't until some years later when I started reading textbooks on Disney film history that I began to learn the names of the great animators who were responsible for these wonderful Disney characters. I learned that it was Frank Thomas and Ollie Johnston who shared credit for Baloo, with my favourite scenes being handled primarily by Ollie. I felt that Ollie was especially adept at giving a certain warm, cuddly feeling to all of the characters he worked with, including Baloo. There was something about the way the eyes of his characters seemed to sparkle with inner life. In 1980, I was able to visit the Disney Studio for the first time, arranged through my friend Russell Schroeder, who was then a top character artist at Walt Disney World in Florida. Russell was kind enough to put in a good word for me with Disney archivist, Dave Smith, at the Burbank Studio, and Dave agreed to host my visit there. As soon as I cleared security and was directed through the main gate of the studio, the first person I saw crossing the lot in front of me was Frank Thomas. I wasn't shy about going up to say hi to him, and Frank generously invited me to drop by the office that he and Ollie were using to compile artwork that would be photographed for inclusion in their upcoming book, "Disney Animation: The Illusion of Life". Needless to say, after going off to meet with Dave Smith, I later took Frank up on his offer to visit with he and Ollie. It was a memorable visit with Frank and Ollie, surrounded by lots of original Disney cels and backgrounds that they were considering for images in their book. They were so gracious towards me, answering all my many questions, (especially about "The Jungle Book") and happily providing info on the artwork they had all around them. The following year, they ended up traveling to my hometown of Ottawa for the Ottawa Animation Festival. They remembered me and it was nice to renew acquaintance. I also provided them each with caricatures I had painted up for them and they appreciated my efforts. 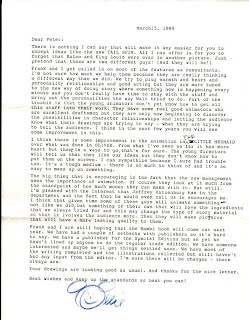 In 1983 I was again visiting the Disney Studio, and Dave Smith was nice enough to have contacted Frank and Ollie before I'd arrived to inquire whether they would be at the Studio that week. Though there were no plans to, Ollie said he'd be happy to come in and visit with me while I was in town. This was a wonderful surprise for me, and Dave left his office for Ollie and I to chat for awhile together. It was during this visit especially that I just was knocked out by Ollie's warmth and generosity in making a special trip to the Studio just to say hi to a young fan. In the years that followed, I corresponded with Ollie and got to see both he and Frank when they were on a book signing tour that brought them to Toronto about a year after I had started my own Disney career in 1984. They expressed their happiness for me in having finally gotten into Disney to fulfill my childhood dream. In 1989, I had the offer to go down to work at Walt Disney World in Florida, provided that they could get me a work permit through U.S. Immigration. 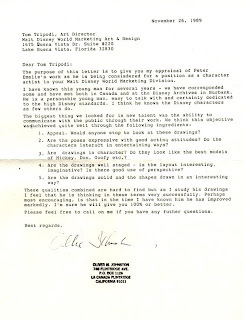 Tom Tripodi, who managed the art department, said it would really help their case if I could get several letters of recommendation from anybody notable within the Disney or related animation industry. I wrote to Ollie Johnston, asking if he would be able to put in a good word for me and, the next thing I knew, I received a copy from Ollie of the letter of reference he had provided to Tom. I remember being so overcome with joy and gratitude for Ollie's sweet generosity in his appraisal of my work. Ultimately, I got the job, and I really felt that it was Ollie's letter that had helped bring it about. I've posted that letter below, as well as a previous letter that shows how generous and inspiring Ollie was in his correspondence with me. While working at Disney, I got to see Frank and Ollie on several occasions, the last time was about 1993, when they were visiting in Florida and Ollie phoned to see if I could meet he and Frank for dinner at Disney's Beach Resort. They mentioned how they both had hit 80 that year, yet they were still in very good health. Though I never did meet with them in person again after that, both Frank and Ollie had been keeping in touch with me for over 15 years through personally designed Christmas cards that we all were producing each year. I may scan in some of those in the days to come to share with you, as both of these wonderful gentlemen were still drawing delightful cartoon likenesses of themselves with their wives on most of their cards. Though a bit shakier with age, their drawings still sparkled with as much life as ever. These cards will continue to bring me great joy in the years to come as I think back fondly on my favourite two of Disney's "Nine Old Men". "Two Hundred Dollars a Day, Plus Expenses..."
Today is the birthday of my favourite actor of all time, James Garner. So I thought I'd draw up a new caricature of him to mark the occasion. 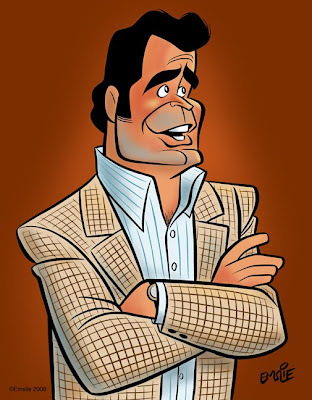 Fortunately, I have plenty of great video reference to work from, but I really felt compelled to depict him in his most famous role of Jim Rockford on "The Rockford Files". I'm so happy that the entire series has been coming out on DVD and I've been enjoying the five seasons released thus far. "The Rockford Files" was one of the shining examples of the type of cop shows that were quite prevalent back in the 70's. Shows like "Kojak", "Cannon", "Mannix", and many others were built around the charisma of their central stars rather than the nastiness of the crimes as in so many of today's series. 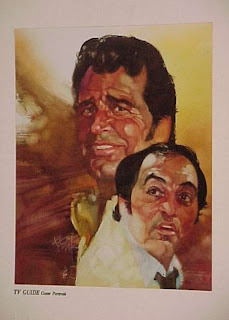 "The Rockford Files" and Peter Falk's "Columbo" were my particular favourites of that popular 70's genre. James Garner had first found success on TV in the role of "Maverick" and, after then going on to prove himself as a leading man in the movies of the 60's, he was lured back to TV to create the role of Jim Rockford, who really was in many ways the continuation of the same lovable con man, Bret Maverick, only this time as a private detective. Not too long ago, I read where writer and series creator, Stephen J. Cannell, had also been inspired by the character of "Travis McGee" in the series of detective novels by John D. MacDonald. Since I'm a big fan of those stories, I guess that's why I also find Jim Rockford so appealing. James Garner had created an onscreen persona of himself as the "reluctant hero" - the guy who would do his best to avoid trouble, but would ultimately come through when he found himself and others in the thick of it. He'd perfected the character in the wartime film, "The Americanization of Emily" opposite Julie Andrews, where in a very key scene in the film he makes no bones about being a coward rather than a hero, as he contends that cowards live longer while heroes get themselves killed in the folly of war. He went on to play the same type of character in another of my favourite films, "Support Your Local Sheriff", before continuing it as the private detective Jim Rockford, who didn't like to carry a gun unless absolutely necessary and didn't even have a permit to own one anyway. Back in 1982 when I was just 22, I was in LA visiting my friend, director Bryan Stoller, who, before I'd flown out there, had told me he was going to try and get us both onto the set of "Bret Maverick", Garner's then current TV series, as he knew I was a big fan of Garner's. 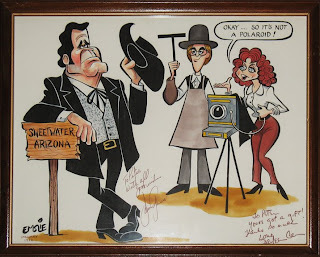 On the chance that Bryan would be successful, I drew up a caricature of Jim Garner in that role and painted up two originals - one to give him as a gift and the other for him to autograph for me. Sure enough, Bryan got us in there through his Warner Brothers connections and I was able to meet Jim Garner in person! I'm happy to report that Jim was as charming and amiable in real life as he'd appeared onscreen. He was tall and ruggedly handsome even in his mid-50's, and looked every bit like a larger-than-life movie star. The whole cast and crew were very nice to us, and even invited us back to watch the next day when they would be shooting the exterior scenes out on Warners' western street set. To the left is that artwork that he'd signed for me. Though James Garner is getting on and old stunt wounds have taken their toll on his knees, he will always remain my favourite leading actor. They just don't make them like that anymore. Happy Birthday Jimbo!